Product prices and availability are accurate as of 2019-04-13 02:46:20 UTC and are subject to change. Any price and availability information displayed on http://www.amazon.com/ at the time of purchase will apply to the purchase of this product. Brayers are great for printmaking, scrapbooking, paper crafts, home decor, and much more. 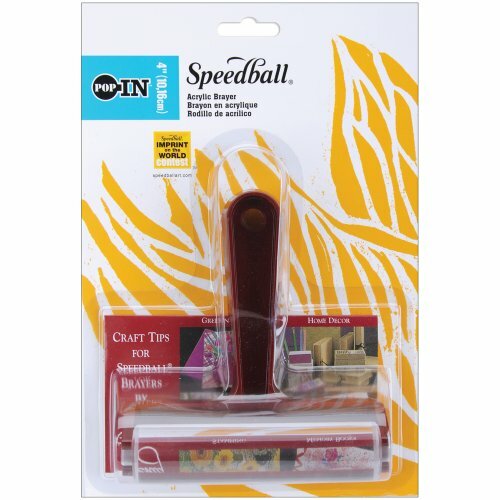 This 4in brayer comes with one acrylic roller that is easy and quick to interchange. Featuring an acrylic roller (clear) for smoothing your glue surface for a bubble free tack, perfect for spreading wax and rubber cement because they will not stick to the acrylic brayer has a burgundy colored plastic handle. Measurements-brayer handle with no roller-4-1/2 by 4-1/2 by 1-5/8-inch, roller-1 diameter. Craft tips booklet by dee gruenig included. Made in usa.